The blondes tend to show the dirt and this one had plenty. Cleaned up nicely, it did. Cleaner or polish will get into those checks and raw wood, so don’t slop it on the guitar. Put it on a cloth first. …it’s the dirt. Talk about obscure references, anybody know that one? Pause… OK, it’s a line from the Broadway show Camelot (“The Seven Deadly Virtues”). And speaking of dirt, doesn’t anybody ever clean the crud off their guitars? You can call it “mojo” or “character” or “honest player sweat” but it’s still dirt and it isn’t particularly good for your guitar. I’ve had a slew of ’em lately that must have 50 years worth of grime, tobacco residue and plain old BO. I’m not real big on cleaning or polishing my guitars either but a bit of maintenance now and then won’t hurt. A damp old tee shirt is a good start but if it’s really gross, then you’ll need a bit of chemistry. 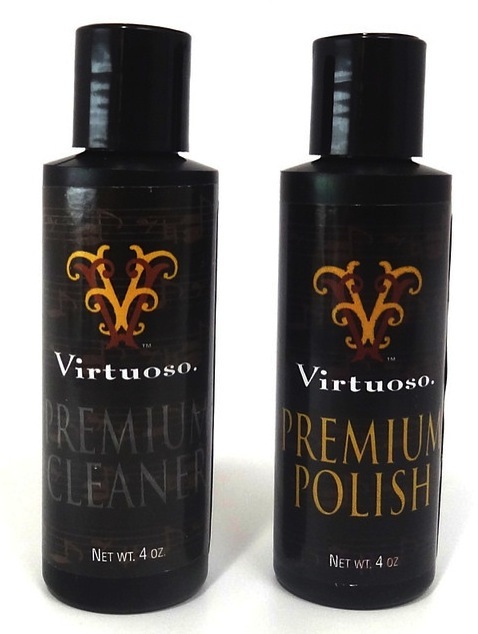 I use a product called Virtuoso Cleaner which, generally, does a good job getting rid of the dirt and leaving the finish alone. You can also use naphtha which, by the way, is essentially lighter fluid so don’t accidentally set your 335 (or yourself) on fire because you were smoking a cigarette while cleaning your guitar. Naptha will not react with the finish but will dissolve a lot of things (sweat, grime, grease, etc). But, before you just slop any chemical on, don’t. Try it somewhere like on the back because it can cause some problems. Like making your guitar look dull and horrible (or duller and more horrible). There are two reasons that I’ve found that render most cleaners pretty well useless. One is easily fixed and that is when there is so much dirt and crap on the guitar that the cleaner takes off just one layer of it and leaves the guitar looking worse than when you started. If you keep at it, you will eventually take off the dirt but it may take a lot of Cleaner and a lot of elbow grease. Or you may have a bigger issue and that’s oxidation. When the elements act on the lacquer, the results are not very pretty. The finish will get dull and look a lot like Gibson’s VOS treatment (which I really don’t like). Cleaning won’t do much for oxidation but if you want to remove what looks like a dull film from your guitar, you’re going to be removing some finish. That’s what polish generally does. It won’t be a significant amount of finish but it will take some. Your guitar will still black light correctly-the finish under the oxidation is still old lacquer and you really won’t be diminishing the guitars value although some might argue that point. I think vintage dirt is like old strings. Worthless. Finally, there is some controversy about using anything with silicone in it. Ask any luthier about that. Avoid it. There are some other things to note as well if you’re going to try to clean your old guitar up. If the guitar is checked, be really careful not to use anything that’s going to get into the wood. Checks are cracks in the finish and sometimes they go through to the wood and any liquid can get in there and stain the wood. It probably won’t affect how the guitar plays but it can look really horrible. So, don’t squirt the cleaner directly on the guitar-instead put it on that old tee shirt and then apply it. That should keep it from seeping through the checking and into the wood. You should also be aware that if you don’t clean it, all that dirt is going to make the finish wear faster if you play that vintage beauty. You’re going to rub it deeper into the finish and it’s going to act like sandpaper and take off even more finish. Dirt is abrasive stuff and abrasive stuff and vintage guitars should avoid each other like the plague. In general, I have no problem cleaning a guitar but I usually won’t polish it and I never buff a guitar with any kind of machine or tool. I’ll go at it pretty vigorously by hand but that’s about it. A nitro finish is pretty thin and the last thing I want to do is screw that up. When I have to clean, I use this stuff-usually the Cleaner. I almost never use the Polish. I don’t sell it, so don’t go all “paid commercial plug” on me. 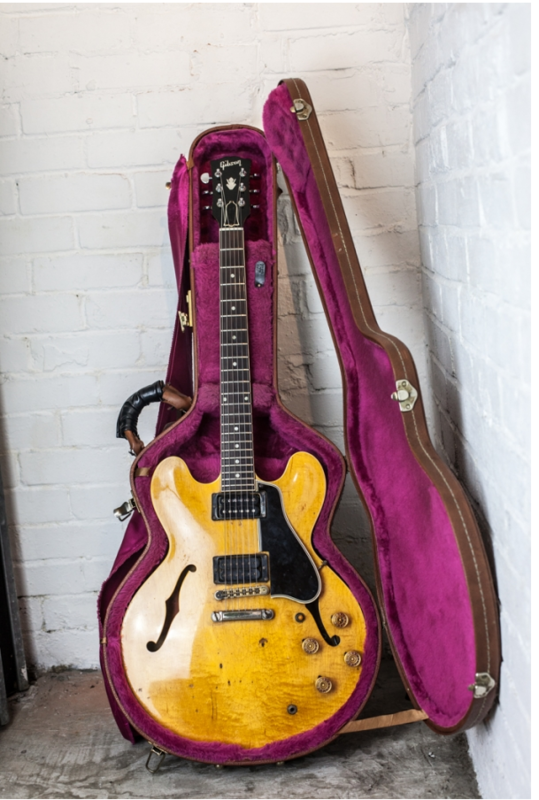 This well played 59 ES-335 was owned by Peter Green, Victor Brox and Jackie Lomax. 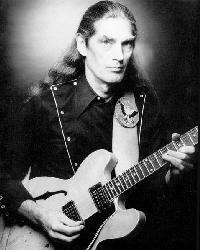 Jackie Lomax played it for more than 40 years. Jackie Lomax with his 59 ES-335. Not sure when the photo is from. Jackie Lomax was on the scene for a very long time and he pretty much played the same guitar for decades. This is something the great players do when they find a great guitar. Larry Carlton is another example-he’s played that late 60’s 335 forever. McCartney and his Hofner, Stevie Ray’s “Number One”, James Burton and his 53 Telecaster and lots of others. Like they say–“the great ones get played.” Jackie wasn’t a guitar god or anything, but he surely is part of the history of British rock. I’ve been asked by the Lomax family to evaluate and possibly sell the guitar for them. So how do I quantify the value of a guitar that was played by Jackie for decades and before that was owned by British bluesman Victor Brox who bought it from Peter Green? Simple. I don’t. You do. If you don’t care who owned a guitar before you-and many, many players and collectors don’t, then it’s just a very cool, well played 59 335 blondie with some changed parts. If history and provenance are important to you and, judging by the prices some famous guitars bring, there are some of you out there as well, then perhaps the guitar is worth a bit more. I wrote in my last post that history, provenance and context are important factors in determining whether a guitar is simply a vintage piece or a piece of history. While this guitar was never an icon, like the Dylan Strat, nor was it used on any mega hit records by a guitar god like Blackie, Brownie and that red 335, it is still an interesting and well documented example of what is probably the most desirable guitar this side of a Les Paul burst. I’ve found You Tube footage of the guitar being played in 1970 and as late as 2004. Unfortunately, I can’t find ’68 footage of “Sour Milk Sea” which is a great song and a showcase for his great voice (as well as George Harrison’s writing chops and Eric Clapton’s guitar). Jackie Lomax didn’t play guitar on it but I’m he used this old 59 to perform the song many, many times during his career. Clearly, not that good at housekeeping. Rockers never are, it seems. …”my ’64 335 is 4 numbers away from Claptons…” my ’59 345 was once borrowed by Duane Allman…” my ’58 335 was played (for 20 seconds) by BB King and autographed…” Does any of this have anything to do with the value and desirability of your guitar? Good question. I get it all the time and I usually avoid it. It’s a pretty slippery slope but it is worth looking into since celebrity guitars are a pretty big business. With Dylan’s Strat selling for $965K recently and Claptons “Blackie” selling for $959K and his 335 selling for $847K, the value of a celebrity owner can’t be denied. There are a great number of factors involved in what makes an historic guitar worth that kind of money and it’s not easy to quantify (or predict). 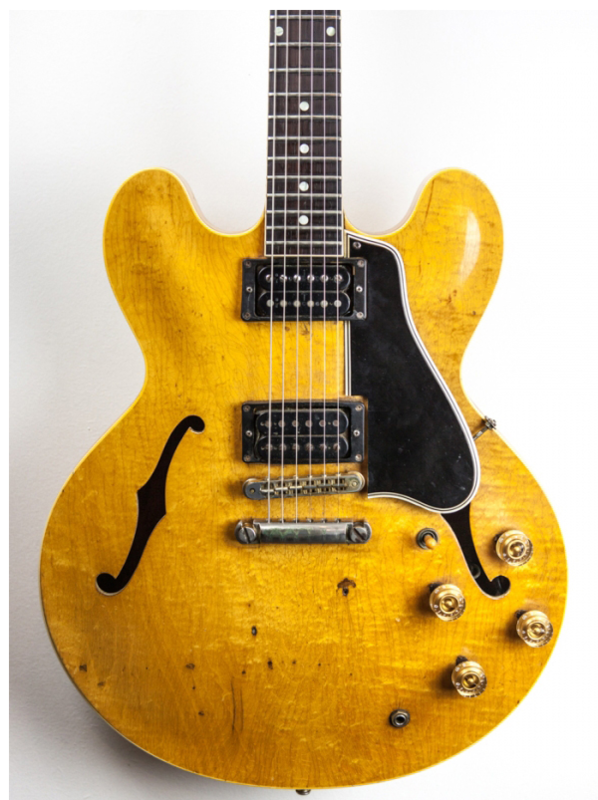 The estimate by Christies auction house on the Clapton 335 was $60K-$80K. Oops. The three examples mentioned at the top are the low end of the celebrity guitar phenomenon and I owned all of them. The Clapton serial number thing is kind of a joke, since Gibson guitars often weren’t numbered sequentially so for all you know, the guitar wasn’t within a month of Clapton’s. I had a 335 that was 4 numbers away and was shipped the same day and got no premium at all for it. To a huge fan, it might be worth a few bucks for the bragging rights or something. I did own a 58 335 that was played for a minute and autographed by BB King. The first thing I did when I got it home was remove the autograph. The guitar was worth more without it. And I owned the “Allman” 345. This is perhaps the most interesting of my celebrity guitars. It was a very fine 59 ES-345 that had some minor issues but was a great player. When I got it the Allman connection was mentioned by the seller but it didn’t really affect the price. I paid what I would normally pay for a ’59 345. If that seems surprising, it shouldn’t. You see, there was no provenance. Providence? No, provenance-the “proof” that it is what you say it is. All I had on the Allman 345 was a conversation with an old friend and very early bandmate of Duane’s who said that Duane borrowed the guitar from him for awhile. No photo of him with the guitar and no corroboration from anyone else. That’s pretty thin provenance and not enough to affect the value. I sold the guitar with a mention of it’s supposed history and got what I would expect to get for a slightly modded 59 ES-345. So, those are the ends of the scale. Huge bucks for a guitar owned and played by a great in an historic context (recording, concert, career) and little or no added value for a guitar with a casual or unproven association with a great. So, I conclude, it is largely the historic context and provenance that gives the guitar the great value. But there is a large-and I mean huge-middle ground here. A guitar autographed by all four Beatles will probably be worth the value of the autographs plus the value of the guitar. The ’64 SG owned by George and played on “Paperback Writer” (and others) would be worth six figures. What about a less famous (but still relatively well known) player? Well, this came up recently and I’m still wrestling with it. This week, I got an email from a nice lady in the UK who asked me to provide some information about her late father’s guitar which she and her sisters inherited. You can’t deny its appeal. 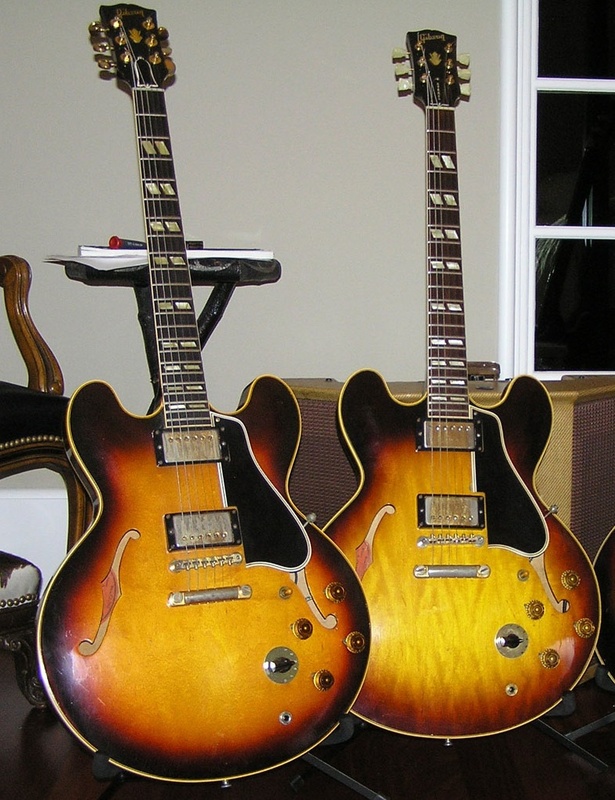 It’s a 59 ES-335TDN which is considered by most to be the top of the 335 heap. Price range is $30K for a beater to over $75K for a very clean one. These peaked at well over $100K in 2008. This one has clearly been played and modded. Grovers, changed bridge, changed neck pickup, Bigsby on and off, speed knobs-all pretty typical mods often made by players. Nice wood and a great vibe for sure but there’s something else. This guitar was a real workingman’s guitar-played throughout much of a 50 year career by a very interesting guy and owned by a few other interesting guys. 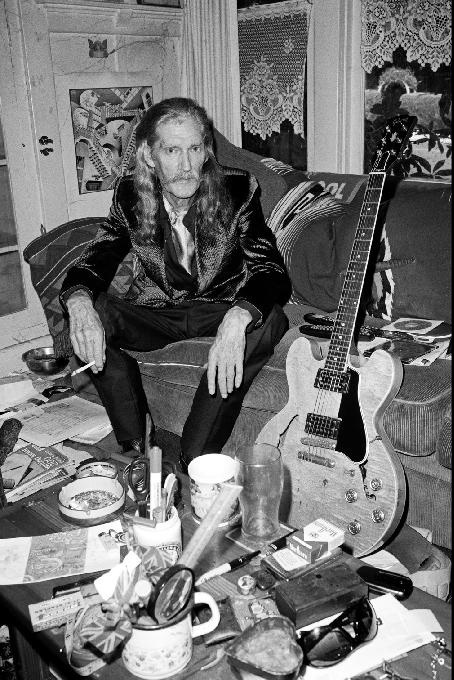 The guitar belonged to Jackie Lomax and was his main player for many years. Look him up if you don’t know who he is. We’ll discuss this guitar in detail in my next post and you’ll find out more about this gem (and who else owned it before him). Nice, huh. ’59 ES-335TDN. Got some issues for sure but it’s got some vibe too. And some history, provenance and context.